We believe that Product Led Growth (PLG) is the future of SaaS. Not just another buzzword, PLG refers to instances when product usage serves as the primary driver of user acquisition, retention, and expansion. So how do companies actually leverage PLG? The best PLG companies flip the script on every aspect of their business. They put their customers first and are obsessive about measuring (and optimizing) every aspect of their funnel. Product usage – not just marketing qualification – becomes the most important trigger for conversion and expansion. The sales team has a product-first mindset and they look and act more like customer success. In this edition of BUILD, you’ll see real-life examples of how leading SaaS companies have successfully implemented PLG strategies across acquisition, conversion and success. The book features in-depth advice from leaders at HubSpot, Intercom, Lucidchart, Mixmax, Typeform, ZipRecruiter, Zendesk, and more. We hope you enjoy it and find strategies that you can take back to your own businesses. 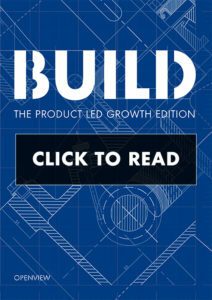 BUILD is a compilation of articles published right here on Labs. To keep up with the best ideas on how to build and scale a software company, sign up for our weekly newsletter here. Do you want to read BUILD on the go?